Mmm, there’s nothing like biting into a crisp, cold pickle out of the jar. 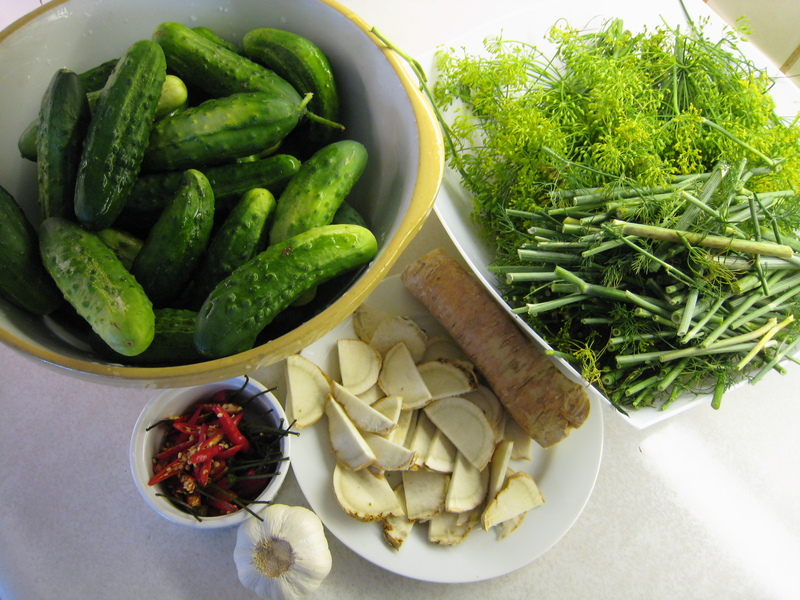 I prefer homemade pickles, so I can make them a little less salty than the commercial ones, and a little spicier. 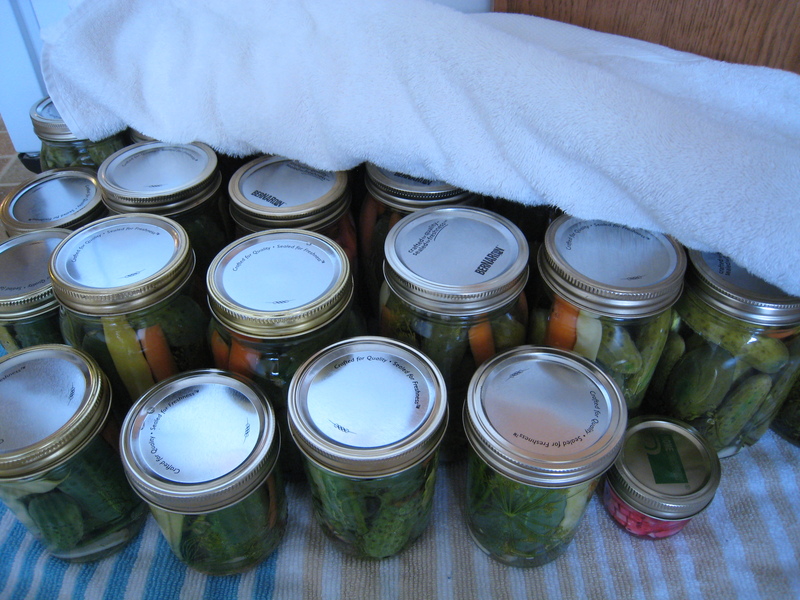 The main thing to remember when pickling is to keep everything clean to get rid of any bacteria. To do this you can boil the jars in a canning pot, put them in the oven at 250 F for 20 minutes, or run them through a hot dishwasher. canning jars (20lbs of pickles makes 20-24 jars – prepare more jars and lids than you think you need) Make sure you only use proper canning jars; reused jars like commercial jam or peanut butter won’t seal properly. You can reuse the rings from year to year, but you need to use new lids so that they will seal properly. 1. 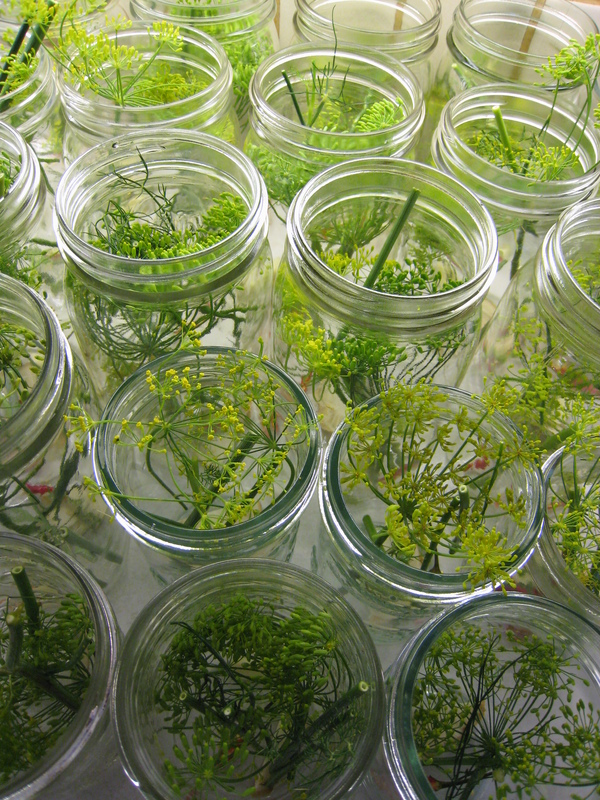 In each jar place some dill (I used one flower head and stalk cut up), a slice of horseradish, one pepper cut in half (don’t cut it if you don’t want the pickles to be very spicy), and one clove garlic. 2. Cram as many clean cucumbers in as you can. I usually start with a few big ones, and save the smaller ones to fit in between and on top. Leave about 2cm of space between the cukes and the top of the jar. 3. Heat brine to boiling, and make sure the water in the canning pot is boiling. 4. Place new lids in a pot of water to heat for a few minutes. This sterilizes them and softens up the rubber, making it easier to get a seal. 5. 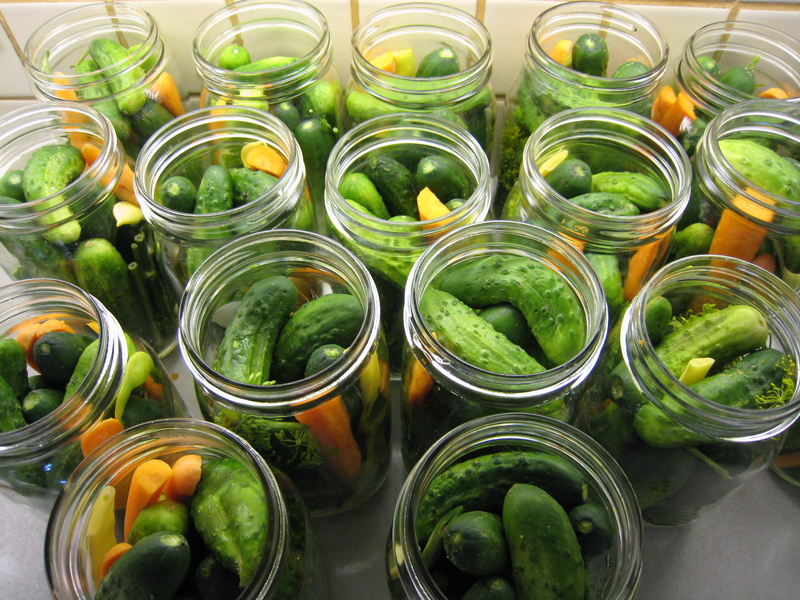 Fill each jar with brine, leaving a bit of space. 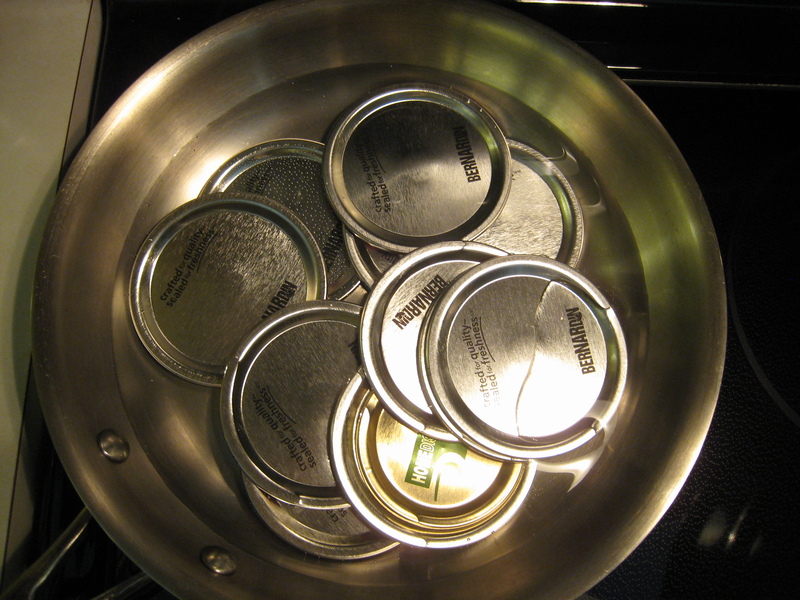 Place the lid and ring on each jar right away and tighten. 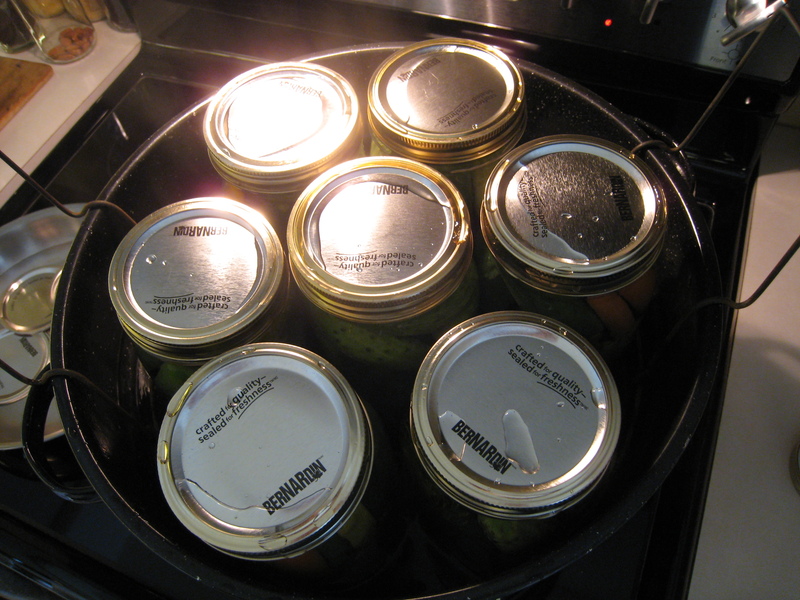 The canning pot I use fits seven jars, so I only filled seven at a time. Place the jars in the canning pot, put the lid on and keep on high heat for just a few minutes; you don’t want to cook the pickles, so if it starts to boil you should remove them. 6. Find a place where you can leave the jars untouched for 24-48 hours. My Oma and Opa always put a towel on the top and bottom, so that’s what I do. 7. Over the next day or so you’ll hear that popping sound that lets you know that your jars have sealed properly. You can also tell they are sealed because the lid has curved down slightly, and it makes a high-pitched sound when you tap it with a spoon, instead of the dull sound of an unsealed jar. If you happen to have one jar that doesn’t seal, just keep it in the fridge until you are ready to use it. 8. I usually wait about three months before I open my first jar. After your first try at making these, you’ll get an idea of what you want to change to make the recipe suit your tastes. Feel free to comment and let me know what you did differently. Here’s a great link for canning info! Crunchy, crisp and a little spicy! I always thought pickling was a big complicated process. Thanks for making it seem easy! I’ll have to give it a try!